In Jacques Audiard’s The Sisters Brothers, assassins Eli and Charlie Sisters arrive in Mayfield, Oregon, a fictional town named after the fearsome figure who runs it. When Eli and Charlie walk into the local saloon to meet Mayfield, they’re expecting to find a man, the burly macho type you’d usually see in a typical Western. Instead, they meet a tall woman dressed in a decorative black bodice, long coat, and jewelry. “Ah, the great man himself,” Joaquin Phoenix’s Charlie says sarcastically when she appears. In Patrick DeWitt’s novel The Sisters Brothers, Mayfield is depicted as a man. In Audiard’s adaptation, the character is a woman played by Rebecca Root. The British actress is best known for starring in the BBC sitcom Boy Meets Girl, which made her one of the first openly trans actors to lead a TV series. 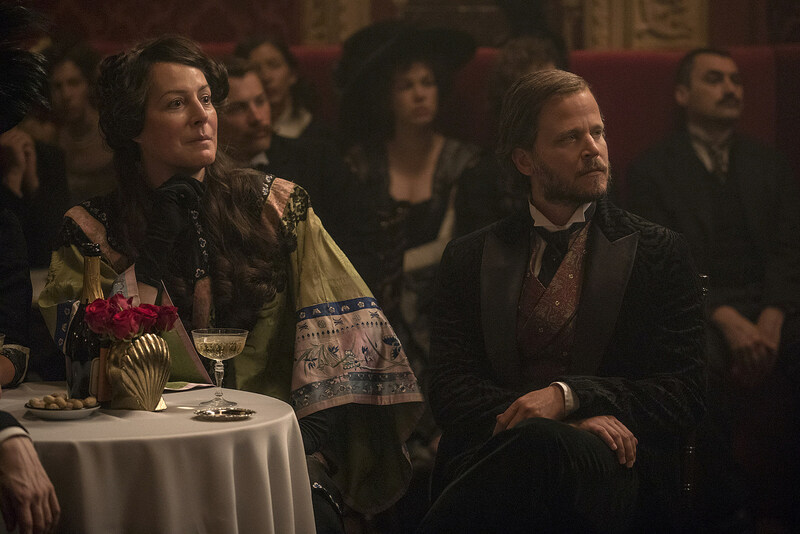 While Root, who is a trans woman, told me she played Mayfield as a cis woman, Audiard’s film never explicitly mentions the character’s gender, leaving it open to our and the Sisters brothers’ interpretation. Is Mayfield a trans woman? A cis woman? Does it even matter when someone as formidable as Mayfield can simply walk into a bar and quickly intimidate two of the best gunslingers in the west? Whenever Hollywood does cast trans actors (and we know how rare that is), it’s almost always in a trans role where the character’s arc and identity revolve around their transness. But in The Sisters Brothers, Root gets to play a badass foe who isn’t defined or restricted by her gender. That’s not the only film that casts Root in a non-trans role this fall either. In Wash Westmoreland’s Colette, Root portrays Rachilde, the French novelist who famously played with gender roles in her work and public life in the late 19th century. After watching both films, I kept thinking that this is exactly what Hollywood needs to do more of – cast actors of trans experience in non-trans parts, as dynamic characters who are more than their gender identity. Root’s performances may be brief, but both films help pave a new path towards a future where casting trans actors in a wide variety of roles can and should be the norm. When I caught up with Root over the phone last week, she told me how liberated she felt playing Mayfield. She also told me about looking at archival photos of potential trans women from the Gold Rush era and how much she’d love to be in a Star Wars movie. Years ago, Root told me, she thought if she ever got the chance to be in big sci-fi film, she’d probably only get to play an alien. But now, having played two non-trans roles in a pair of prominent fall movies, she realizes that she could just play a, you know, human being. Because why not? It’s so exciting to see you in two movies this fall, and both even opened on the same weekend. I know! Thank you so much. It’s extraordinary, isn’t it? Ask any actor and if you’re lucky maybe you’ll get a movie a year or something, but to get two and then for them to open on the same weekend – and they’re also hitting similar film festivals; they both played at TIFF, they’re both playing at London – it’s mad. I bet. This must be an amazing experience. It’s great. I always say, as an actor you’re only as good as your last job. I don’t know what your experience is knowing intimately the life of an actor. It is a bit precarious, it is a bit scary. I don’t have my diary book filled for the next six months. I’m doing a play at the moment in Dublin and I’m rehearsing next week, but after that play finishes in a month’s time, I’ve got nothing else to take me through until whenever. So it’s a little bit scary, but at the same time you enjoy the buzz of the work you put in a year ago, 18 months ago, and you just hope that the work will pay off and someone will see your performance. Hopefully you’ll land even more parts after these two films. Aw I hope so. I am delighted with both of them. I’m absolutely thrilled. I think they’re both beautiful, gorgeous films. But I think Mayfield in Sisters Brothers could be a dealbreaker for me. I just get a feeling it’s the sort of part that might just open the door a bit more for me in the States and get me into some meetings that I previously might not have had a chance at. How did the role of Mayfield come to you? In the book, Mayfield is depicted as a man. But in the movie, it’s so refreshing to see the character as a woman. Especially to see a powerful and feared female figure in a Western. That’s so rare. So to be honest with you, if I hadn’t been cast as Mayfield and another trans woman had been, I would’ve still said, “Oh that’s a stroke of genius.” Because I think it totally turns everything upside. And [producer] Alison Dickey and John C. Reilly – they said, “Well, if Jacques wants to cast Rebecca, we’re happy with her performance. Let’s have it, it’s a great idea.” Because they might have said, “We want a star, we want somebody who’s going to put more bums on seats,” or whatever, as if they don’t have four famous enough actors already. You’ve said before that Jacques was more ambiguous about Mayfield’s gender, even though you played her as cis. What were the conversations like between you and him about the character and how to portray her? Yeah, in my mind I played her as cis. We had the conversation, because he showed me some inspiration cards and photos, actual period photos of the time, of women with facial hair. Some of these women looked like they maybe had hormonal imbalance, they might be cis women with facial hair. One or two of these photos looked like they were possibly a cis man wearing a dress or a skirt. But it was all very ambiguous. There’s no place I’ve read in literature about the mid-19th century trans experience, and certainly in that context I think it’s quite extraordinary. They found this reference point of people running gambling joints – Were they trans? Were they cis? Were they just tough women? Were they butch lesbians perhaps? I don’t know. And when I asked Jacques and Milena Canonero, the costume designer, I said, “Well, what should I be playing?” And they said, “We don’t need to have that conversation. Just play her as you’ve been playing her. In your mind you have what you want. It’s up to the audience to infer what they see.” And I was happy to go along with that. In a way, if you asked Jacques now or in a year’s time about casting and what he felt [about] Mayfield, I think he would say, “I just wanted a strong woman.” But I think he’s interested in the ambiguity that a trans woman gives. So as I say, I don’t know, I haven’t had the conversation with him recently. It’s certainly one for the film academics who will maybe analyze and break down the movie. I’d be interested to hear what they have to say about it in years to come. I really love that because for me, as a trans person, it’s so refreshing to see an actor of trans experience like yourself play a character who isn’t explicitly trans. Yeah, absolutely. It’s brilliant, isn’t it? Thats why I love Mayfield and playing her, not just the fact that it’s a period drama and a Western and the sheer joy of working with such extraordinary talents. But a part from that, it was like, yeah, this is a great role, full stop. She is a great character, full stop. It was so refreshing and so liberating that I kind of wanted more. [Laughs] We all kind of wanted more, but that’s the nature of the part. She had a handful of scenes and that’s that. Brief, but memorable. Completely. And in Colette in you play Rachilde. I found it so interesting that in real life she presented as masculine at times and called herself a “man of letters.” She seemed to play with gender in a lot of ways. Yeah. I think we went down the more – her garb and the costume I was given was more female and feminine in the movie. But certainly in real life Rachilde was possibly what you might consider genderqueer, she certainly rocked the boat and was very much part of that gender subversion that Colette herself was part of. Rachilde’s famous novel is Monsieur Venus, you should try to get your hands on a copy and read that. It’s a bit 19th century, but it really does turn your expectations upside of a bodice-ripper, if you like. The cis female picks a rather effeminate cis man and she starts dressing him in women’s clothes, so there’s very much a sort of gender subversion going on there. It’s a pretty powerful piece of writing. In thinking about your Mayfield and Rachilde, to me, both of these roles feel like the direction Hollywood needs to move towards – casting trans actors in roles where gender isn’t the sole focus of the character or narrative. Is something you want to see more of from casting directors? Oh my god, yes. Of course. It’s interesting, isn’t it, that Wash Westmoreland is a Brit, Jacques Audiard is a Frenchman. Both being European – I always sort of felt like the States were leading the way with the trans experience [on screen], but maybe that’s just on TV. Maybe now we’re seeing a British and European theatrical filmmakers beginning to step up the game and leading the path a little bit. And hopefully “Hollywood” will follow that example and will start putting trans actors into their movies. I mean, I love the films that I’ve done, but I would also love to do a Star Wars or something, you know? What fun would that be. It’s funny because in the past I kind of always thought, if ever I did to a sci-fi movie I would be playing some kind of crazy, weird alien. But actually, there’s no reason why I should play an alien, because I could just play, you know, a Homo sapien [laughs] who happens to be tall strong woman. It doesn’t have to be anything unusual. So maybe that’s going to be the next ceiling to break through.